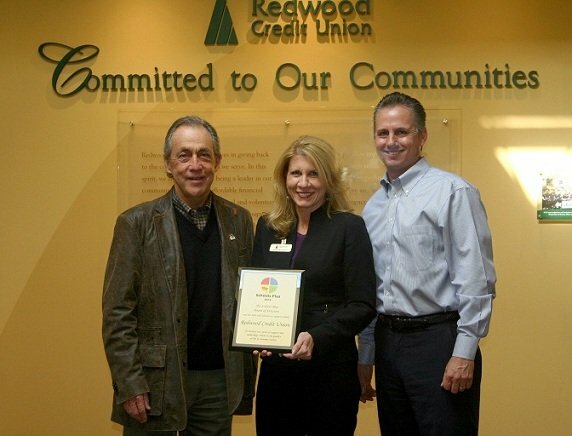 The $1.9 billion Redwood Credit Union in Santa Rosa, Calif., was recently recognized by Schools Plus for 22 years of support and leadership critical to the quality of life in Sonoma County. From left, Schools Plus Chairman John Bribiescas, Redwood CU Senior Vice President Robin McKenzie and Redwood CU President/CEO Brett Martinez. The $1.9 billion Redwood Credit Union in Santa Rosa, Calif., was recently recognized by Schools Plus for “22 years of support and leadership critical to the quality of life in Sonoma County.” Schools Plus is a partnership of parents, educators and community businesses that provides funding for sports, music, art, drama and other enrichment programs in local schools. RCU has provided board leadership and fundraising event sponsorships for Schools Plus.